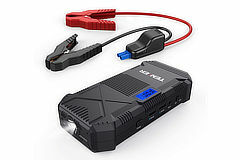 Get yourself out of bother on a cold Winter's morning with this Tenker 600A 14000mAh Portable Jump Starter. Boost your vehicle's battery in an emergency, petrol engines up to 5L or diesel engines up to 3.5L, up to 20 times on a single charge. Or charge your mobile phone or tablet from the USB ports. The prize draw closes on 1st February at 8.00pm.